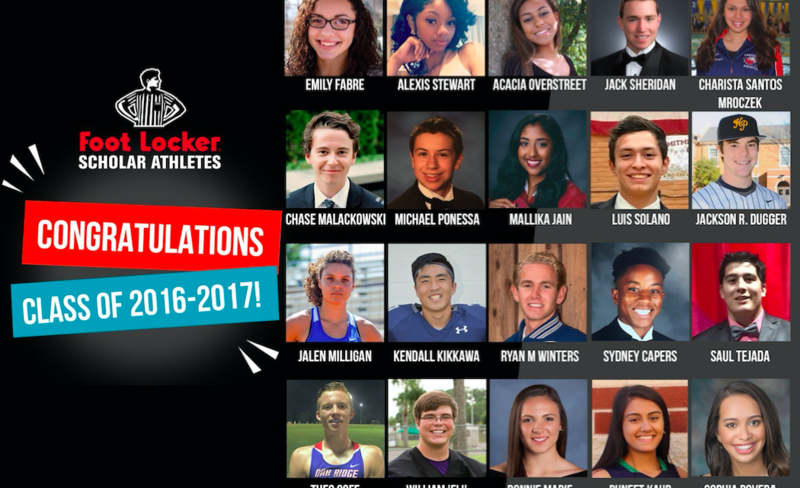 Foot Locker Foundation Inc. provided $20,000 college scholarships for 20 high school student-athletes through its sixth annual Foot Locker Scholar Athletes Program Award. Seniors Jalen Milligan and Kendall Kikkawa are two of these standout individuals. Milligan’s diverse athletic portfolio includes varsity track and field, varsity softball, USA track and field, Junior Olympics and competitive dance. She was the first female to qualify for the Oklahoma state track meet in a sprint, a hurdle, a throw and a jump. Milligan also uses athletics to contribute to her community. In addition to other volunteer work, she’s organized free track clinics and also started a program, called the Exchange Zone, where people donate new and used sports equipment to young athletes in need. Milligan wants to run track professionally as a heptathlete, and looks forward to studying exercise science in the Wichita State Honors Program. Like Milligan, Californian Kendall Kikkawa strives to create a sense of community both on and off the field. An accomplished football, basketball and baseball athlete, Kikkawa serves as co-captain of all three of his varsity teams. He also tutors with the Boys and Girls Club, and has traveled to Nicaragua to work with community service groups and volunteered time visiting with patients at La Mascota, a pediatric cancer hospital. Kikkawa also co-founded Changing the Community Giving Circle, an organization supporting change-makers in the Asian community, which raised nearly $45,000 in the three years since its inception. Today, the Foot Locker Foundation Inc. announced the recipients of this year’s scholarship program, which each year rewards 20 outstanding student-athletes who demonstrate exceptional academic ability and strong leadership skills in sports, school and within their communities with $20,000 to support their college dreams. Since the program’s inception in 2011, the Foot Locker Foundation has invested more than $2 million in the education and future of some of America’s most promising scholar-athletes. Supporting this all-star program is Fastweb, a trusted scholarship and financial aid resource used by students to help find opportunities to pay for school. The Foundation also proudly announced the recipient of the Ken C. Hicks Scholarship, an additional $5,000 scholarship (for a total of $25,000) awarded to one of the inductees, in honor of the organization’s former chairman and CEO. Southern California high school senior Ryan Winters took home the award for exemplifying elevated academic achievement, personal passion and a true love of the game. Milligan, Kikkawa and Winters are just a few examples of the exceptional student-athletes that the program recognized. 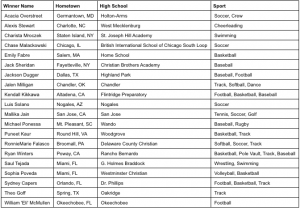 The seventeen other young people awarded scholarships represent a variety of sports disciplines, personal achievements, community involvement, and come from diverse backgrounds. Together, these 20 students have overcome economic hardships, loss, and disabilities, but in the face of these challenges, have created opportunities not just for themselves, but for others, as well. Their work, their spirit and their determination ensure that they’ll continue to have a positive impact in all their future endeavors.